Compare the best online dealer prices before you buy 1 oz Canada Silver Maple Leaf (Random Year) coins. 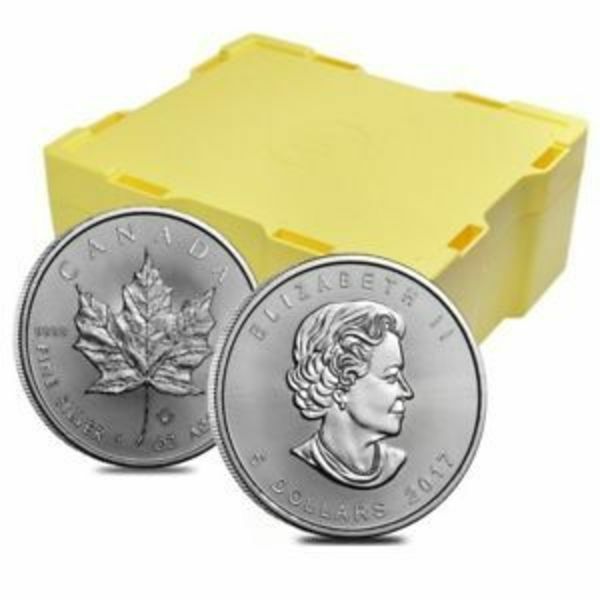 The 1 oz Canada Silver Maple Leaf (Random Year) coin contains 1 troy ounces of silver bullion. The melt value of one 1 oz Canada Silver Maple Leaf (Random Year) coin is $15.08 based on the current silver spot price. 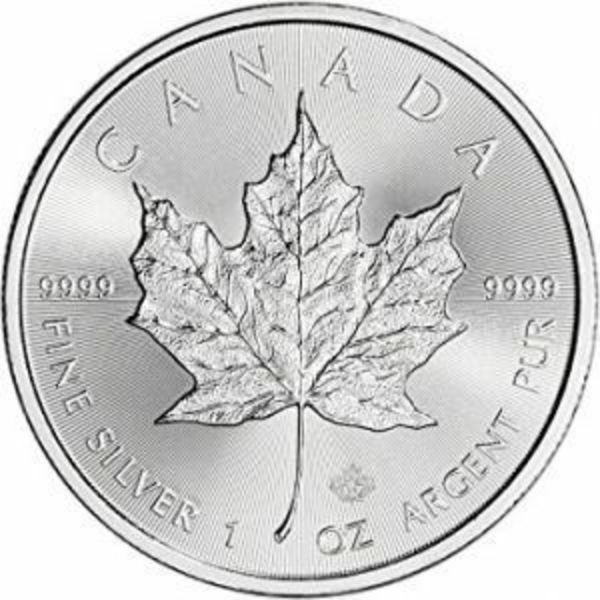 The average price for 1 oz Canada Silver Maple Leaf (Random Year) for the past 7 days is $17.13. The Canadian Silver Maple Leaf is a silver bullion coin issued annually by the Government of Canada and produced by the Royal Canadian Mint. The Silver Maple Leaf is legal tender with a face value is $5 Canadian dollars. The market value of the metal fluctuates with the spot price of silver. The 99.99% silver content makes the coin among the finest official bullion coins worldwide. The standard version has a weight of 1 troy ounce (31.10 grammes). The Silver Maple Leaf's obverse and reverse display, respectively, the profile of Elizabeth II and the Canadian Maple Leaf. In 2014, new security features were introduced: radial lines and a micro-engraved laser mark. The Canadian Silver Maple Leaf is one of the most affordable government issued bullion coins available and secondary market random year Canadian Silver Maple Leaf Coins often have a lower premium than other government bullion coins such as the American Silver Eagle Coin. The Royal Canadian Mint also produces the Gold Canadian Maple Leaf Coins that are available in full troy ounce and fractional gold sizes. 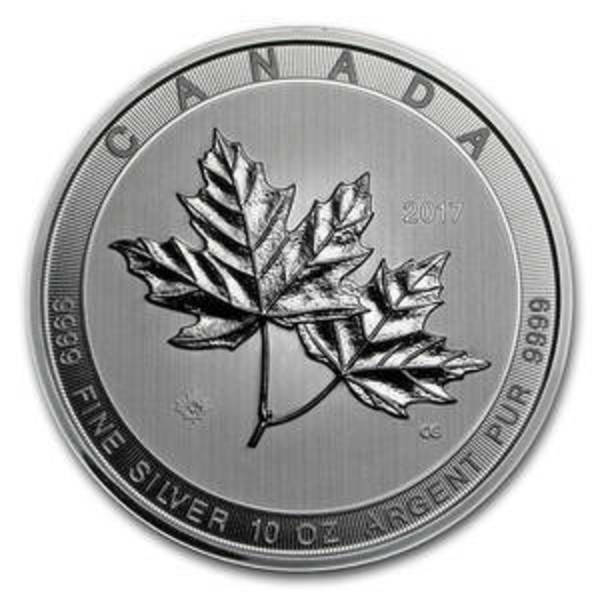 FindBullionPrices.com searches over 30 national, reputable and trusted bullion dealers to find the lowest prices on 1 oz Canada Silver Maple Leaf (Random Year) and other Canada Silver Maple Leaf Coins products. The prices on our site for silver bullion and coins are updated hourly and adjusted for silver spot price. We give you the tools to compare silver prices from reputable and trusted bullion dealers. Compare 1 oz Canada Silver Maple Leaf (Random Year) prices across bullion dealers to pay the lowest price. We will help you find the best prices for 1 oz Canada Silver Maple Leaf (Random Year) when you're ready to buy.